Please join us in welcoming Daniel Beaty to Omaha on February 15, 2013, at 7:30 PM at the Holland Center. This event is free for D2 Center students. 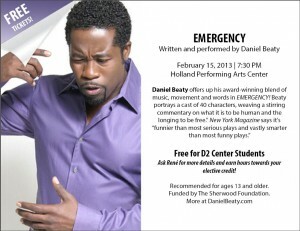 To learn more about this award-winning actor, singer, & writer, visit http://danielbeaty.com. To see him in action, check him out on YouTube! Please call René at 402-502-8534 with questions or to sign up. Students who attend may earn hours towards a Careers & Community Engagement elective credit. For more information about this event, see the flyer (PDF).